Michael Caruso underlined his status as a dark horse contender at the Red Rooster Sydney SuperSprint by topping final practice ahead of qualifying. 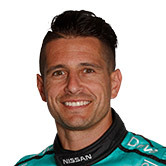 The Nissan driver, who has qualified no higher than eighth in a horror season, backed up his strong Sydney form that had seen him first and fifth in the two Friday sessions. Scott McLaughlin showed the way for much of the business end of Practice 3 having moved 0.5s clear at the top with a 1:29.28s 25 minutes into the 45 minute run. The championship leader lowered that benchmark to 1:29.11s on a new set of tyres with 11 minutes left, but was left perplexed by the modest gain. “The green tyre felt completely different to what it did yesterday,” he said, noting that today’s set was from a different batch than the one he used yesterday. McLaughlin watched the final minutes from the garage, with his time holding up until Caruso clocked a 1:28.86s to jump from 16th to first with the chequered flag flying. Caruso, who sits 19th in the championship, says this weekend’s form has been a long time in the making. “The speed has come from the last three months of testing, trying, running 18th, 20th… absolutely nowhere,” he said. “People on the outside probably don’t understand that sometimes you have to do that to move forward. “We’re pretty confident on my car that the path we’ve taken will get us where we want to be. “The thing I’m most happy about over the last two days is that it’s consistent. "Clearly over the last few months that’s what we haven’t seen from our car. Brad Jones Racing’s Tim Slade ended up third despite narrowly running out of time for a final run. 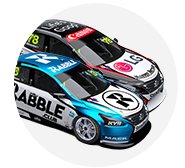 Fabian Coulthard, Mark Winterbottom, Craig Lowndes, Cameron Waters, Shane van Gisbergen, Will Davison and David Reynolds completed the top 10. Jamie Whincup was down in 14th, while running wide at the final corner on his best lap saw Chaz Mostert 16th. Qualifying will take place from 1335 local time this afternoon.